Occurrence: Carrot is consumed as raw or as a cooked vegetable. It is often an ingredient in stews and hotpots. Carrot can also be found in some cakes. Allergy Information: Carrot allergy is generally associated with allergy to birch pollen or with the celery-carrot-mugwort-spice syndrome. Allergy to carrot seems rather less common than the related allergy to celery. The most common symptom of carrot allergy seems to be the oral allergy syndrome as is often seen with other birch pollen related allergies. However, as for celery, severe symptoms have been reported for carrot allergy. The symptoms of carrot allergy from more than 50 patients have been reported. They include oral allergy syndrome (OAS), angioedema, urticaria, dyspnea, vertigo, tightness of throat or chest, dysphagia, hoarseness, cough, rhinitis and conjunctivitis (Helbling et al. 1994 ; Ballmer-Weber et al. 2001 ). In addition, 50 % of the patients studied by Ballmer-Weber et al. (2001) had a history of systemic reactions. A case of anaphylaxis and rhinoconjunctivitis induced by raw carrot in a non pollen allergic patient was reported by Fernandez-Rivas et al. (2004) . Ballmer-Weber et al. (2001) used either raw carrot by the prick to prick test or commercial carrot extracts. Fernandez-Rivas et al. (2004) used raw and boiled carrot. Histamine dihydrochloride (10 mg/mL) was used as a positive control, and the glycerol-containing diluent of the prick solution was used as a negative control. A 3mm diameter wheal was considered positive (Ballmer-Weber et al. 2001). 26 patients with histories of allergic reactions to carrot (Ballmer-Weber et al. 2001). 18/20 patients with positive DBPCFC results and 2/4 patients with negative DBPCFC results were CAP test–positive for carrot (≥0.7 kU/L). Thus, determination of specific IgE to carrot by the CAP method showed an SE of 90% and an SP of 50% (Ballmer-Webner et al. 2001). Protein separation was performed using 12.5% polyacrylamide 1D SDS-PAGE gels. Samples were reduced with beta-mercaptoethanol. In addition, two-dimensional PAGE was performed at pH 5.3-10.0 and reducing conditions (Fujita et al. 2001). Carrot extract was separated with Tricine SDS-PAGE using 14% T, 2.6% C separating gel and a 4% T, 2.6% C stacking gel. Proteins were reduced by 1,4-dithiothreitol (Ballmer-Weber et al. 2001). Proteins were transferred to nitrocellulose membranes using a semidry device. Membranes were blocked with 2% (w/v) skim milk , incubated with sera (1:6 dilution) and bound IgE detected by horse radish peroxidase conjugated goat anti-human IgE. Blots were stained by Coomassie brilliant blue R-350 (Fujita et al. 2001). Proteins were transferred onto nitrocellulose membranes by semidry blotting and blocked twice in 50 mmol/L Tris(hydroxy-methyl)aminomethane/HCl buffer (pH 7.4) containing 0.15 mol/L sodium chloride and 0.3% (v/v) Tween 20 (TBST). Blots were incubated with patients’ sera and bound IgE detected with alkaline phosphatase-conjugated mouse antihuman IgE (Ballmer-Weber et al. 2001). 14% of the patients recognised the 20 kDa protein (Cyclophilin), and proteins with masses of aproximately 27 and 12-14 kDa (Fujita et al. 2001). Patients recognised the Bet v 1–related major carrot allergen Dau c 1 (85%) and 20% the carrot profilin. Other sera recognised proteins between 34 and 70 kDa (Ballmer-Weber et al. 2001). Carrot allergy is associated with a sensitization to celery, mugwort and birch pollen which is explained by cross-reactions between homologous allergens present in these plants (Hoffmann-Sommergruber et al. 1999; Ballmer-Weber et al. 2001; Helbling et al. 1993). However, Moneo et al. (1999) suggested that a sensitization to Dau c 1 induces IgE antibodies that do not cross-react with birch pollen allergens. Identification of Cyclophilin as an IgE-Binding Protein from Carrots. Hoffmann-Sommergruber K, O'Riordain G, Ahorn H, Ebner C, Laimer da Camara Machado M, Pühringer H, Scheiner O, Breiteneder H.
Molecular characterization of Dau c 1, the Bet v 1-homologous protein from carrot and its crossreactivity with Bet v 1 and Api g 1. Lettuce and carrot allergy: are they related? Diagnostic approach to anaphylaxis by carrot, related vegetables and horsetail (Equisetum arvense) in a homemaker. Fernandez-Rivas M, Gonzalez-Mancebo E, van Leeuwen WA, Leon F, van Ree R.
Nature of main cross-reacting proteins:Cyclophilins are ubiquitous but sera reactive to carrot cyclophilin does not cross-react with the allergenic cyclophilin from birch pollen (Bet v 7). Allergen properties & biological function:Cyclophilins catalyse cis-trans isomerization and thus may assist in protein folding. Allergen purification:Fresh carrots were homogenized in 30 mM Tris-HCl (pH 8), filtered through cheesecloth and centrifuged. Proteins were precipitated by 70% ammonium sulfate. The precipitate was dialysed against 30 mM Tris-HCl with 1 mM EDTA (pH 8) and passed through a TSK gel Super Q-Toyopearl 650 column and again precipitated, disolved in 20 mM MOPS with 1 mM EDTA (pH 6), desalted with a PD-10 column and applied to a Hi-trap SP column. Fractions were eluted with 20 mM MOPS with 1 mM EDTA (pH 6) and a gradient of 0-1.0 M NaCl. The IgE binding fraction was concentrated and chromatograhed on a TSK gel G3000SW HPLC column in 20 mM Tris-HCl, 1 mM EDTA and 0.15 M NaCl (pH 7.5). The allergen was identified using pooled sera from patients with atopic dermatitis and was found to be an active cyclophilin after the 15 N-terminal residues were found to be closely homologous to other plant cyclophilins. Calculated Masses:17799 Da for Dau c 1.0101, 16125 for Dau c 1.0102, 16071 for Dau c 1.0103, 1603 for Dau c 1.0104, 16049 for Dau c 1.0105 and 16518 for Dau c 1.0201. Not known but likely to be thermolabile as other members of the Bet v 1 family. IgE cross-inhibition studies between Dau c 1, Bet v 1 and Api g 1 indicate the presence of common epitopes (Hoffmann et al. 1999). Allergen properties & biological function:Dau c 1 is a Bet v 1 homologue allocated to the family PR10, proteins expressed upon pathogen attack, stress and abiotic stimuli. However its precise function is not known. Recombinant Dau c 1 has been purified using a hererologous expression systen, E. coli, as a hexahistidine-tagged fusion protein and further purified by Ni-chelate affinity chromatography (Hoffmann et al. 1999). Other biochemical information:Hoffmann et al. 1999 have cloned and expressed 3 proteins called Dau c 1.1, 1.2 and 1.3. The predicted pIs are 4.47, for Dau c 1.1 and Dau c 1.2; and 4.39 for Dau c 1.3. Sequence homology of the 3 isoforms was 97-100% and identity of 96-99%. Ebner C, Hirschwehr, R, Bauer L, Breiteneder H, Valenta R, Ebner, H, Kraft D, Scheiner O. Identification of allergens in fruits and vegetables: IgE cross-reactivities with the important birch pollen allergens Bet v 1 and Bet v 2 (birch profilin). Identification and characterization of allergens related to Bet v 1, the major birch pollen allergen, in apple, cherry, celery and carrot by 2-dimensional immunoblotting and N-terminal microsequencing. 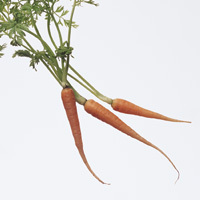 Allergen purification:Carrot LTP was produced as recombinant protein in Pichia pastoris and natural carrot LTP was purified by ion-exchange chromatography and gel filtration. Characterization of the non-specific lipid transfer protein EP2 from carrot (Daucus carota L.).